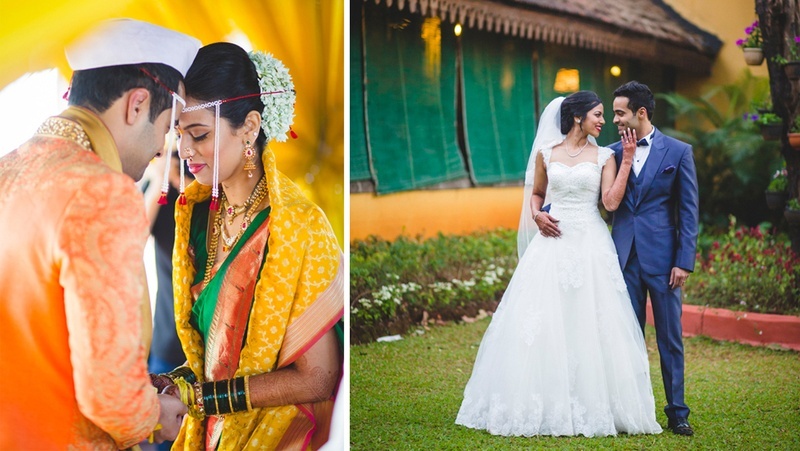 When Bageshree and Jeff’s cross cultural wedding landed in our inboxes, we were confused, amazed and mesmerized at the beauty of this celebration! This couple’s whose love wasn’t subject to religion or caste decided to celebrate this cross cultural wedding in three distinct ways. They first had a hindu varmala, followed by a Maharashtrian wedding ending the celebrations with a christian themed reception. The team at The Wedding Crasher shot this crazy-fun wedding brilliantly. Capturing those candid moments, those secret laughs and so much more perfectly! Scroll on to see how Bageshree and Jeff nailed all three kinds of cross cultural wedding ceremonies brilliantly. Celebrations began with the Hindu varmala ceremony where Bageshree and Jeff exchanged varmalas as a sign of the beginning of a new life together. The varmala ritual dates back to the times as written in Vedic literature, where as part of the swayamvar, the bride pick her husband out of many suitors by the action of putting a garland around his neck. This sweet, love-filled ceremony has grown leaps and bounds over the years and now is a ceremony that signifies the bride and groom’s acceptance of each other. We lovelove this pretty bride and her pretty smiles that just seem to light up the entire atmosphere. Since the first half of this cross-cultural wedding affair was completed with the Maharashtrian marriage ceremony, it was time to do justice to the second half with the Christian themed wedding reception. Dressed in a mesmerizing A-line white wedding gown with beautiful floral appliques and a scatter of tiny crystals, this bride looked nothing short of a princess. And to complement her regal ensemble, Jeff wore a sharp navy suit with a classic white shirt – a combination we absolutely love! Bageshree and Jeff made sure each element was executed beautifully, to the T! The candid pictures with the bridesmaids, the super splendid sparkler entry and even the gorgeous wedding cake – each aspect had bouts of prettiness that we just couldn’t ignore.